My sister made this delicious watermelon salad last night and to us, it is the perfect summer salad to accompany just about any meal. whisk together and pour over salad to moisten and serve immediately. Thank you for finding my blog. Dovecote Decor is giving away an adorable table on Freebie Friday for HGTV tomorrow. Leave a comment for a chance to win. Your blog is so lovely. Thanks for visiting me! Seems easy enough! I'll give this a try. We are sure that this summer salad will taste delicious, it looks so very pretty and it seems easy enough for even kitchen incompetents such as us to accomplish!! What is not to like?!! Perfect it is! OH MY! So simple and refreshing. I'm always hesitant to put fruit in salads...but this sounds so good, I may have to give it a try. annie this look mouth watering. and i bet it is still v good w/o the cheese. someone just gave me a recipe for watermelon salsa. what would summer be w/o watermelon? Yum, this sounds super delicious! Your posting this recipe is most timely. We have company tomorrow night and this is the perfect salad as one of our guests, dislikes anything green and she will love the cheese and watermelon. Your blog does not disappoint. I love melon in a salad--this recipe looks perfect! Thanks ...sounds simple and delicious! This looks so refreshing, and it's so hot today! 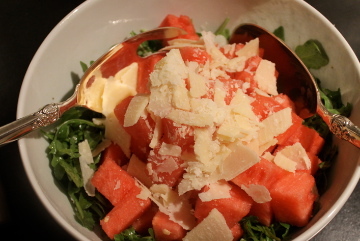 The combination of the melon and the Parmesan looks especially wonderful. Oh this sounds simply delicious! Thanks for sharing. Watermelon is my all time favorite. This looks so yummy and I'll be sure to try it!